Bach's cantatas are among the highest achievements of Western musical art, yet studies of the individual cantatas that are both illuminating and detailed are few. In this book, noted Bach expert Eric Chafe combines theological, historical, analytical, and interpretive approaches to the cantatas to offer readers and listeners alike the richest possible experience of these works. A respected theorist of seventeenth-century music, Chafe is sensitive to the composer's intentions and to the enduring and universal qualities of the music itself. Concentrating on a small number of representative cantatas, mostly from the Leipzig cycles of 1723-24 and 1724-25, and in particular on Cantata 77, Chafe shows how Bach strove to mirror both the dogma and the mystery of religious experience in musical allegory. 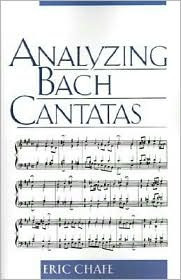 Analyzing Bach Cantatas offers valuable information on the theological relevance of the structure of the liturgical year for the design and content of these works, as well as a survey of the theories of modality that inform Bach's compositional style. Chafe demonstrates that, while Bach certainly employed "pictorialism" and word-painting in his compositions, his method of writing music was a more complex amalgam of theological concepts and music theory. Regarding the cantatas as musical allegories that reflect the fundamental tenets of Lutheran theology as established during Bach's lifetime, Chafe synthesizes a number of key musical and theological ideas to illuminate the essential character of these great works. This unique and insightful book offers an essential methodology for understanding one of the central bodies of work in the Western musical canon. It will prove indispensable for all students and scholars of Bach's work, musicology, and theological studies.